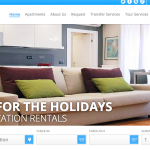 As you may know, at Kigo we like to share with vacation rental managers tips on how to improve a vacation rental business and boost bookings. 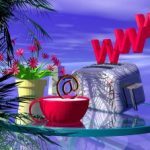 An excellent way of showing the importance of operating your own holiday home website is to showcase some of our trusted clients' websites. Under the spotlight this week is Edinburgh at Home who primarily provide luxurious vacation rental apartments in Edinburgh. Edinburgh at Home offer guests 4 star self catering apartments in the heart of the Scottish city set in a unique welcoming development. Located only a short walk from the main shopping street in Edinburgh, making them ideal for weekend trips away. Edinburgh at Home's properties demonstrate an excellent standard and hold a certain charm which is prevalent throughout their website. Edinburgh at Home have gone for a very clean cut website layout which works excellently. As you land onto the homepage, photos of the beautiful city of Edinburgh immediately catch your eye. The inclusion of professional photos of their vacation rental location exerts professionalism and puts Edinburgh under a very desirable light, a great tool for encouraging bookings. Navigating around the website is simple and refreshing, Edinburgh at Home have worked to ensure that the user is not bombarded with too much information, instead including everything a booker needs to proceed with making a reservation. The home page features a short welcome note which isn't text heavy and doesn't put potential guests off, which is so important in increasing bookings. A good standard of customer service is already set on Edinburgh at Home's website. They have included a full page of FAQs, all neccessary contact information and full list of activities in the area under each property description. That way, guests will know exactly what to expect with their vacation rental. 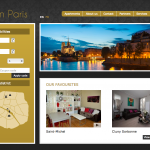 Edinburgh at Home make the booking process as painless as possible for their guests. Users are greeted with an availability search tool on the home page which also holds the same position on the apartments and inquiry pages, making it really easy for potential bookers to find a suitable apartment at any point of the browsing process. They have really paid attention to detail throughout their website; each property listing includes a full list of amenities and activites in the area, a very informative property description and beautifully photographed images of the selected property. 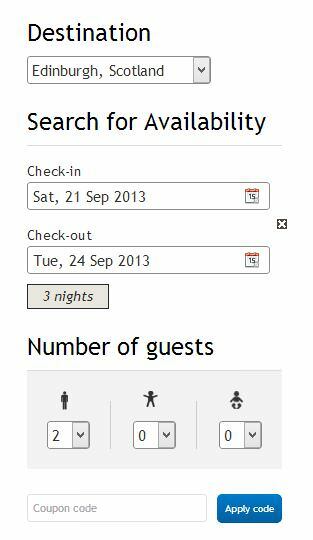 From there bookers can define check in/check out dates and number of guests to check availability or use their availability calendar positioned at the bottom page to get a yearly view. For some properties, Edinburgh at Home allow guests to book instantly using Paypal. The other properties require a simple booking enquiry form which saves any properties the user has viewed, that way they can easily organize them in order of desirability in case their first chosen property is unavailable. 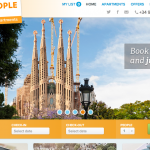 What we liked on Edinburgh at Home's website is their decision to partner with other vacation rental companies. On their apartment listing pages, they also feature rentals in the historic city of York, the bustling capital of London and across the mediterranean sea in Barcelona. This is an excellent marketing technique for referring customers when booking calendars are full and vice versa. Whether it be a family holiday, weekend away or business trip, if you're looking for holiday lettings in Edinburgh, or you would like to network with Edinburgh at Home, you should without a doubt take a look at their website. 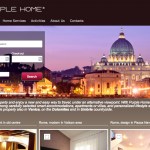 Please note that the website samples we provide are only to spotlight the websites of our clients. To respect the time and effort these agencies have put into creating their websites, we ask that you do not replicate design elements or content pieces.